Politics • Utah moms say Ann Romney debate misses the real point. Al Hartmann | The Salt Lake Tribune Former Utah lawmaker Holly Richardson. Sarah A. Miller | The Salt Lake Tribune Sandy Christensen has 12 children ranging from 6 months to age 26 and is author of the blog Twelve Makes a Dozen. Jim Cole | AP file photo In this June 2, 2011, file photo former Massachusetts Gov. 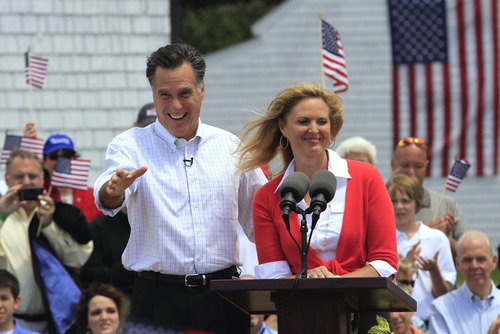 Mitt Romney, accompanied by his wife Ann, arrives to announce his 2012 candidacy for president in Stratham, N.H.
Sandy Christensen has experienced all variations of the mommy track. 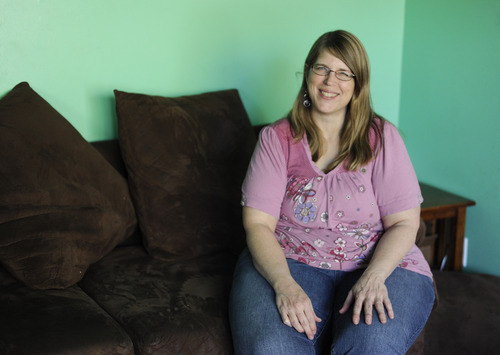 Christensen worked full-time outside her home until she had her fourth child. She worked full-time from home until she had her seventh child. At that point Christensen, who now has 12 children, gave up being a wage earner to focus full-time on her family. "Either way, it's hard," said Christensen, who has a masters degree, taught college-level writing and worked as a technical writer. "You just make up for it in one way or another." So the recent dust-up over whether Ann Romney's status as a stay-at-home mom canceled out her ability to relate to working moms struck Christensen as much ado about nothing. Democratic strategist Hilary Rosen remarked on CNN last week that Romney, 63 years old and the mother of five grown sons, was incapable of giving her husband  presidential candidate Mitt Romney  useful advice about women's economic concerns because she had "never worked a day in her life." "It's one of those things that has been debated forever," said Christensen, who lives in South Jordan and chronicles her life at twelvemakesadozen.blogspot.com. Paul Taylor, executive vice president of Pew Research Center and director of its social and demographic trends project, said the debate has long been settled. "At one level, the mommy wars is over, if you mean by 'mommy wars' that working mothers and stay-at home moms are judging each other about choices they made," Taylor said. Instead, there is broad acceptance that the movement of women into the work force is a good thing, Taylor said, and of modern marriages in which both husband and wife work and share parenting and home responsibilities. But Taylor said public opinion is more divided about what's best for children and whether mothers of very young children should work outside the home. "It tilts a little more negative, though most people don't have strong opinions," Taylor said. In a survey the nonprofit organization conducted last fall, 37 percent of respondents said "more mothers of young children working" is bad for society; an equal percentage had no opinion on whether that was a good or bad thing. A 2008 survey that asked the same question found Republicans were more likely to consider having a working mother to be "bad" for a young child than were Democrats. Pew Research also has shown that, compared to the late 1990s, more mothers want to work part-time; also, working mothers feel more rushed in their daily lives than other women or working fathers. Working moms who say they always feel rushed also are more likely to express less satisfaction with their lives. Rosen, who has two children, later apologized to Romney and called for a truce in the "phony war" triggered by her comment. In a blog post at CNN, Rosen said mothering was the "hardest job I have ever had." Rosen also reiterated what may have been her real point: given economic realities, most women do not have the option to stay home with their children once they become mothers. That's true even in Utah, home of the Church of Jesus Christ of Latter-day Saints, which has long encouraged its female members to choose, if possible, family over work once they become mothers. According to state data, about 74 percent of Utah mothers with school-age children work and 59 percent of Utah mothers of preschool-age children work outside the home. Utah women who have been able to make the same choice Romney did  without the household help and top-tier income  found themselves defending her and their own decisions last week. Christensen said that despite her lifestyle, Romney has had to make the same home management decisions other moms face. "You are still mom, you still have to run everything, you're still in charge," she said. "All that work is still there." Even before giving birth to triplets two years ago, Kara Gallagher said being a stay-at-home mom was "always the plan." While statistically, most stay-at-home mothers in the U.S. have only a high school education, Gallagher is a college graduate. "Who better to benefit from my higher education than my own children," she wrote on her blog, http://www.wellredlife.com, just as the Rosen/Romney debate ignited. "It was pretty frustrating for me," said Gallagher, 31, of Cottonwood Heights. "I think being home with my kids is just as important as any paying job I might have out of the home." "It's a choice and I'm very fulfilled and happy with staying at home," said Gallagher. "I get really bothered when people dismiss me when they think I'm just a mom and am not as valued as a person." And that pinpoints the problem Salt Lake resident Alison Herzog, mother of a six-month-old son, had with the Rosen/Romney flap. Before marriage and becoming a parent, Herzog wasn't sure if she wanted to be a stay-at-home mom or the primary wage earner with a stay-at-home husband. For now, the need to pay off student loans, help support her family and the enjoyment she gets from her job lured her back into the workplace after her son's birth. She has a flexible schedule that lets her work from home two days a week. "I think women need to stop talking about which is better," said Herzog, who has an MBA and is a social media manager at a local bank. "That's counterproductive to what we need to be doing. We need to work together to move forward to get more rights for women. Instead of putting energy into a debate between moms, we need to work together to make sure our kids are getting the best of what they need." Regardless of what their moms are doing, she added. 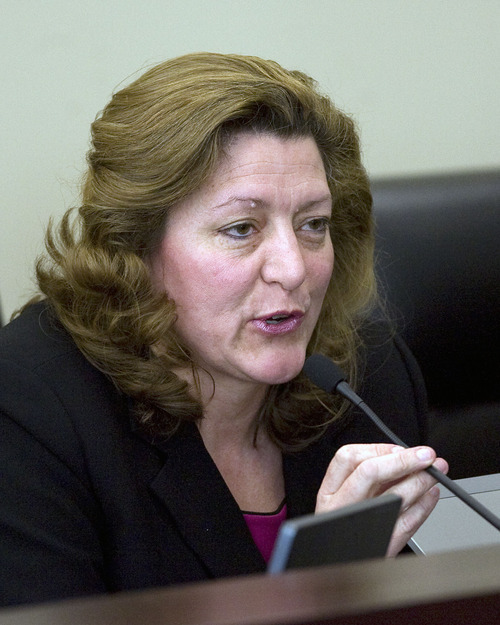 Holly Richardson, a former Utah legislator who still has 12 of her 20 living children at home, seconds that view. "I understand that in politics we go to the extremes at times to make our point," she said. "But I would hope people on both sides of the aisle understand the need to value what women do." The Pew Research Center says public support for women in the workforce is strong, but is more mixed about mothers of young children. It found that 73 percent of the public think movement of women into the workforce has been a change for the better. But just 21 percent said mothers of young children working is good for society. Another 37 percent said that was bad for society, while 38 percent said they saw no societal difference when those mothers work.